for this Kerala PSC Excise Department Women Civil Excise Officer Examination is 25-10-2018. 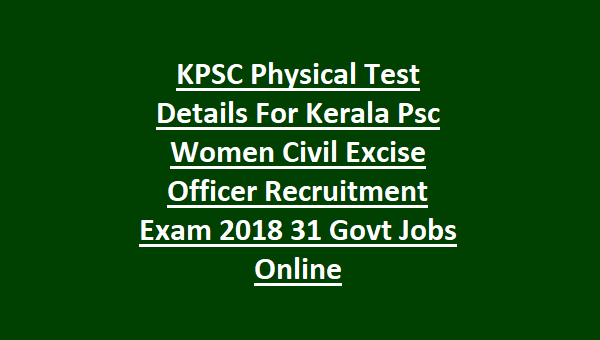 The selection for Kerala KPSC Women Civil Excise Officer Recruitment 2018 is through Physical Standards tests, physical endurance tests and physical efficiency test. 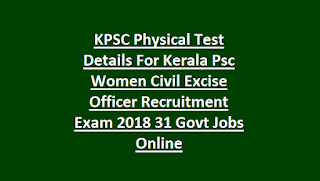 The eligible female candidates who qualified +2 exam they have to submit online applications for this Kerala KPSC Civil women excise officer jobs through www.keralapsc.gov.in. For more details regarding Physical Endurance Tests, PET/PST, salary, age limits, qualifications and other information of KPSC Women Excise Officer jobs information, see the below given information. KPSC Notification of Kerala PSC Women Excise Officer Jobs Examination. There is no application fee for this KPSC Kerala PSC Women Excise Officer Recruitment. There are total 31 vacancies available in Kerala CIVIL POLICE. Must have passed the Plus Two Examination. Selection for this KPSC Kerala Excise Department recruitment is held in various stages. Written test will be in the form of Objective type multiple choice questions. Click here to see the Exam syllabus for the KPSC Kerala Women Civil Excise Officer Recruitment 2018. Minimum height is 152 cms. For SC/ST 150 cms. Candidates have to complete the 2 KMs running within 15 minutes. If you are a new candidate you have start with one time registration at www.keralapsc.gov.in. Using OTR you have to fill the application form online. If you are already registered before, no need to register again. After logging in click on online application for Women Excise Officer and complete the application form. Upload latest image and signature, mobile number and email id. Submit the application form online before the closing date of 25-10-2018. Click here to apply online for the Kerala Public Service Commission Women Excise Officer Recruitment 2018. Please share this KPSC Kerala Women Excise Officer Recruitment 2018 article to your lovable friends through online social networking sites.